“What Art and Poetry Can Teach Us about Food Security”: A TED Talk on John Keats and John Constable by Professor Richard Marggraf Turley. In his TED Talk “What art and poetry can teach us about food security,” Professor Richard Marggraf Turley dives deep into two classic works of British Romanticism: John Keats’ poem “To Autumn” (1819) and John Constable’s painting The Hay Wain (1821). Both present picturesque scenes from the English countryside that, on initial glance, appear far removed from the period’s volatile political debates. But Professor Turley encourages us to look closer. Both works, he suggests, bear the mark of one of the major social problems of the time: hunger. Both Keats and Constable lived through times in which the English countryside underwent considerable change: food prices, growing at a rapid rate, brought wealthy speculators to England’s agricultural areas, many of whom bought up large swaths of the land. The results were devastating: families who had tilled the ground for generations found themselves pushed off the land as early versions of industrial farming took root. Mass unemployment ensued, inflated food prices soared even higher, and much of the country went hungry. 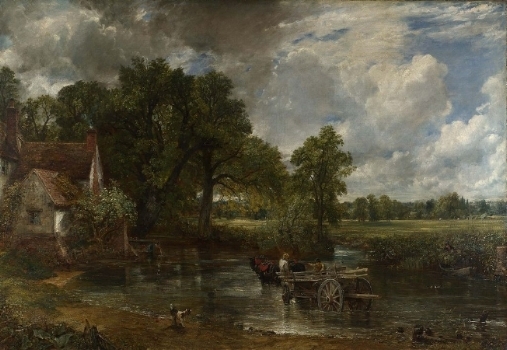 Constable's The Hay Wain (1821), completed a year after the publication of Keats' great poem, "To Autumn"
As Professor Turley fleshes out the deeper layers of each work, he shows us how even the most seemingly apolitical subjects, like a solitary artist’s contemplation of nature, bear the weight of major political controversies. He also shows us how these artists can help us to have our own conversations about hunger and poverty today: in our time as in the Romantic period, many in the middle and lower classes regularly struggle to put food on the table. Have a listen to Professor Turley’s talk to learn more about how writers like Keats and painters like Constable can help us face our greatest obstacles, as food waste, soil erosion, and economic turmoil create a whole new set of hunger problems in the twenty-first century. Richard Marggraf Turley is Aberystwyth University's Professor of Engagement with the Public Imagination. He has published and taught widely on the Romantics, and he is one of the organisers of the International Keats Conference. He is also a blues guitarist and velocipedist. Professor Michael Demson on the Real-World Impact of Shelley's Writing. A Summary by Jonathan Kerr. John Keats’s ode To Autumn is one of the best-loved poems in the English language. Composed during a walk to St Giles’s Hill, Winchester, on September 19 1819, it depicts an apparently idyllic scene of harvest home, where drowsy, contented reapers “spare the next swath” beneath the “maturing sun”. The atmosphere of calm finality and mellow ease has comforted generations of readers, and To Autumn is often anthologised as a poem of acceptance of death. But, until now, we may have been missing one of its most pressing themes: surveillance. Professor Sharon Ruston of Lancaster University is offering a free online course through Future Learn called "Humphry Davy: Laughing Gas, Literature, and the Lamp". These types of course are fun and informative. If you are interested in Shelley you will want to learn more about Davy because Shelley studied him closely. Shelley was one of the last great polymaths - he was well versed with a range of subjects that dwarfs most of his famous contemporaries. Science was one of them. To understand Shelley fully, you need to understand his interest in science - this course can help you to do this. I was very excited to hear that Shelley's poem Ozymandias features prominently in the new movie in the Alien franchise: Alien: Covenant. The poem's theme is woven carefully into the plot of the movie, with David (played again by Michael Fassbender) quoting the famous line, "Look on my works ye mighty and despair." What immediately drew me to Zac Fanni's excellent article was his discussion of the Ozymandias scene. However, what I found amounted to so much more. We are offered a kaleidoscopic array of classic romantic allusions including some which are more obvious, for example Frankenstein and Rime of the Ancient Mariner; and some that are decidedly less so: Shelley's Alastor makes an unexpected appearance! Shelley Lives - Taking the Revolutionary Poet Shelley to the Streets. Last fall Mark Summers did something absolutely fantastic: HE ACTUALLY TOOK SHELLEY'S POETRY TO A STREET PROTEST. Read his moving account of his experience. There are lessons for all of us in his experience. I think Mark's article is one of the most important I have published - and every student or teacher of Shelley needs to pay close attention to what Mark did. The revolutionary Shelley would be ecstatic! What I love about Mark Summers' writing is his ability to put Shelley in the context of his time, and then make what happened then feel relevant now. Both Mark and I sense the importance of recovering the past to making sense out of what is happening today. With madcap governments in England and the United States leading their respective countries toward the brink of authoritarianism, Shelley's revolutionary prescriptions are enjoying something of a renaissance; and so they should, we need Percy Bysshe Shelley right now! One of the great things about studying Shelley is where it can take you if you are intrepid. In the course of his short life he traveled to Ireland, Wales, Scotland, Devon, France, Switzerland and Italy - and some of the places he visited are among the most sublime and picturesque in Europe. Join Anna Mercer for a trip to Shelley's Mont Blanc! P B Shelley’s ‘Mutability’ can, in this way, promote discussion of the Shelleys’ creative collaboration. What we know of the Shelleys’ history provides evidence for their repeated intellectual interactions, as Mary Shelley’s journal shows an almost daily occurrence of shared reading, copying, writing and discussion. The Shelleys’ shared notebooks (not just the ones containing Frankenstein) also indicate that they would use the same paper to draft, redraft, correct and fair-copy their works.